Thai and True's amazing sauces are made in Portland, Oregon by Thai natives. 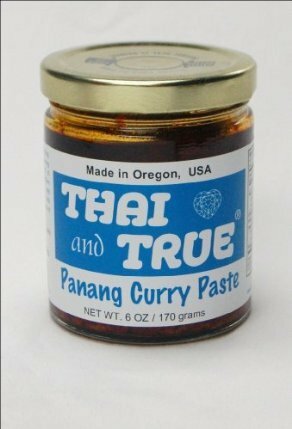 Use Thai and True's Curry Pastes for coconut curries, stir fries, sautees, grilling or marinades. No artificial preservatives or flavors; strictly all-natural ingredients. Ingredients: Panang curry paste (dried red chili 20%, shallot, lemon grass, garlic, salt, galangal, kaffir lime zest, coriander seed, cumin powder), rice bran oil, 100% freshly squeezed lemon juice and cumin. If you have any questions about this product by Thai and True, contact us by completing and submitting the form below. If you are looking for a specif part number, please include it with your message.